Official LR Conspiracy: Take the Crown Preview Cards! 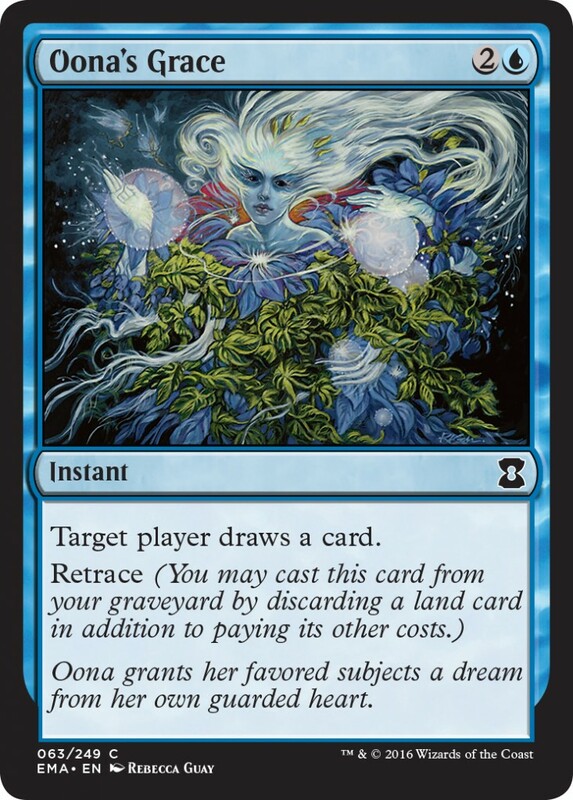 We’ve got two preview cards from Conspiracy: Take the Crown to take a look at. Let’s dive right in! 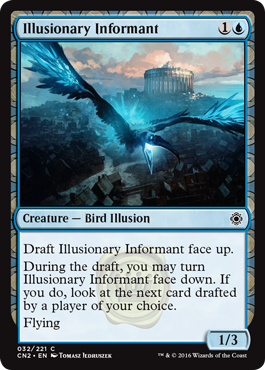 Illusionary Informant satisfies the curious part of every drafter. If you just have to know what a player took for a specific pick, you finally can just ask them and they actually have to tell you! Not sure how good a 1/3 flyer is on its own, so you’ll want to get a lot of value out of the information during the draft if you take this one. Spire Phantasm crosses the line from draft to game, while adding a super fun little sub-game in the process. 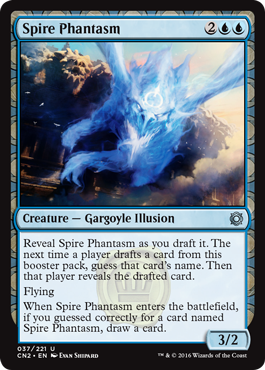 The cool part is that once you name a card correctly with your first Spire Phantasm, all future copies will benefit from it, moving it up in value. Here they are, the official, exclusive Eldritch Moon preview cards! Ride Down is back! 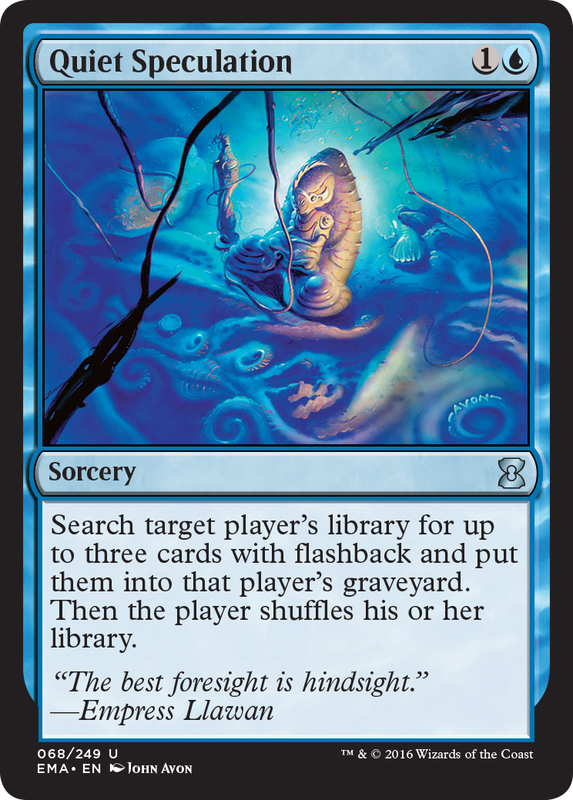 After a year on the bench, this powerful gold uncommon is back in Eldritch Moon. Ride Down lets you power through a ton of damage while killing opposing blockers in the process. 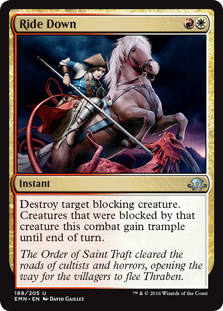 It’s best in an aggressive deck; thankfully white red tends to be an aggressive color combination. 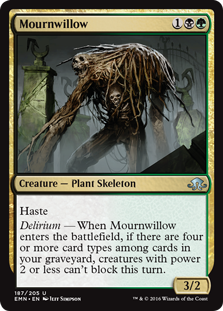 Mournwillow is very cool, combining two colors that don’t normally equate to aggressive beatdowns, and coming up with exactly that. Really curious to see where this one goes! 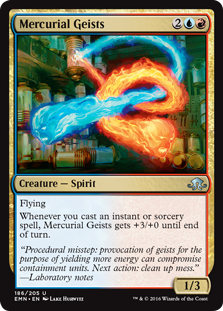 Mercurial Geists will remind you of Wee Dragonauts, but this is a bigger version in that you get +3/+0 rather than +2/+0. 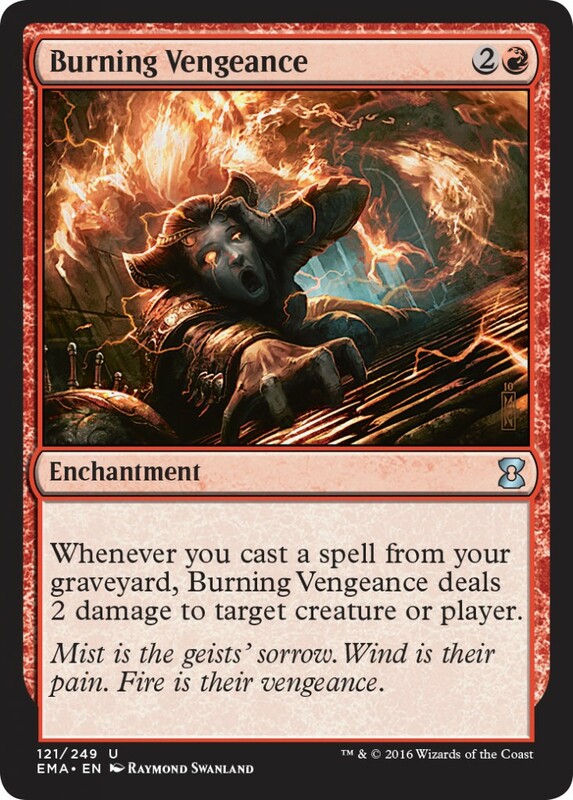 The 1/3 flyer for four mana is below curve, but it doesn’t take too many activations before it’s a 4/3 flyer for long enough to get your opponent dead. Exclusive LR Eternal Masters Preview Cards! Here we have our exclusive previews from Eternal Masters! First we have a doozy, Burning Vengeance! One of our favorite cards from Innistrad is back, and just begging to be built around. For our first clue as to what kind of cards we may be triggering Burning Vengeance with, we have Quiet Speculation. You have to figure there are targets with flashback in the set right? Right. Cannot wait to draft this deck! As I’ve mentioned on the show, I’ve been working on my video editing skill set so I can produce more video content for LR. I’ve got the first video finished for a new series I’m tentatively calling LR Depth Check. Large – sped up games, with voiceover – Depth Check, we get to go deep on a line of play, a decision, a pick, a block, whatever. My reasoning is pretty straightforward on these: You can watch full-length draft videos on CFB or wherever your favorite drafters draft. But for some people, the time commitment of watching a full draft plus all rounds is daunting. Additionally, since the player is under the constraints of the clock, they often can’t go as deep as they’d like with their explanations. I’m trying to get a 2-for-1 by shortening the games that aren’t super interesting and going wayyy deeper on the spots that are. I want your feedback. I make these for you, and I want to know if they are useful or just meh. These wouldn’t be possible without our Patreon supporters. Thank you. I like being able to devote resources to this kind of thing and I wouldn’t be able to justify it otherwise.